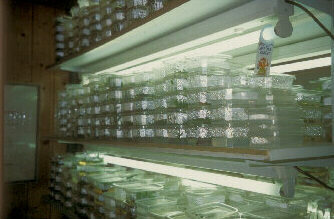 The In-Vitro cultivation is oftenly the only reasonable way, to propagate big quantities of Carnivorous Plants in a relatively short time. The idea is quite simple: To grow and propagate the plants in controlled conditions, you give them the ideal medium to grow, so all the needed nutrients will added to a solution, like in a fertilizer. To get the solution solid, when ready to use, you have to add a matrix, usually Agar or Phytagel! Additional good quantities of sugar will be added, to supply the plantlets with energy. The problem: this solution is also ideally for the growth of all kinds of microorganisms like fungi, bacteria, algae.... which will overgrow and kill the plants in a very short time. 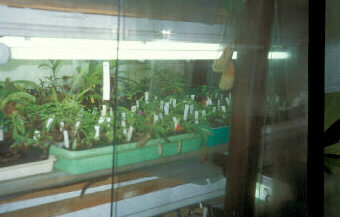 What is to do: you have to grow these plants free of all these microorganisms, but spores etc. of it are everywhere in the air, on any surfaces and so on. So you have to be carefully, to be sure that all steps of propagation will be done under sterile conditions, so, step one is, to get the medium sterile, you will do it by autoclaving all the medium, that means, that you add high pressure (1bar) and high temperatures (120°C) for some time (usually 20 minutes to the medium, to kill all the remaining spores and microorganisms, like you will do it in the kitchen with your legumes, when you put it to a steam-cooker. The vessels for the plants also have to be sterile, so usually you also will autoclave it! Now, you have to work at sterile conditions; professionally you will do it at a cleanbench; here, the air get pressed to a filter with micropores, unpassable for microorganisms and spores in a chamber, which is free of contamination. Here you can add medium to the vessels, transplant plants and so on without contamination. Now still 2 problems remain: How can I get plant-material steril? Usual Plant-material or seed are overgrown with microbes, which have to be killed. The easiest way ist with seeds, because they are more robust; you will add chemicals to 'bleech' it for some time, so long time, that the microorganisms are killed, but the seed is not yet harmed by it! The same you can do with parts of plants, but they are much more sensitve! So, the 'bleeched' seeds you can put on your sterile solution, the medium and grow sterile plants out of it! The second remaining problem: how can I propagate now the plants? To propagate the plants, usually special hormones (Cytokinines) will be added, which force the plant to divide; than you can seperate the single plantlets from this 'clone' and grow each other as an own individuum! Later on you can get the plants out of the vessel and put at non-sterile conditions on earth, sphagnum or whatever to continue to grow it up like other plants! At this step, the establishment to the usual, much harder conditions must be done very carefully at good humidity, because the plants are at this stage still vey weak with just a thin cuticulla, until they get adapted now back to the normal conditions! Ready, now you can grow the plants like any other 'usual-grown' specimen too; oftenly they are still more vigorous, due to its energy, which they have got preliminary by the cultivation 'In Vitro'. This procedure takes a lot of time and money, but it is the only reasonable way, to propagate slow growing and dividing species like Heliamphora or Nepenthes. So, oftenly rare and endangered species can be grown safely and made available for the public, to get a good stock of plants in cultivation all over the world, without destroying or endangering wild habitats.